That’s why our global coalition of economists & activists today published a report on initiatives all over the world to keep oil in the soil. The EJOLT network and Oilwatch say that keeping most oil in the soil is the best way to slow climate change, prevent resource wars and move towards an energy transition. The report tracks successful campaigns and innovative proposals that aim to stem the flow of crude at the source. Bill McKibben’s translation of the climate science in an article for The Rolling Stone – Global Warming’s Terrifying New Math – went viral in the US. Never before have so many people in the US taken to the streets for the climate and this has been accompanied by a wave of divestments from the fossil fuel industry. In May 2013, the international press also warmed to the fact that there are a lot of unburnable fossil fuels. “Unburnable carbon” has become a buzz phrase in The Economist and in The New York Times. But while that welcome story is now developing in the North, one tends to forget that movements fighting oil extraction have been alive and kicking in the South for two decades. The idea of leaving oil underground was perhaps born in the Niger Delta. In 1995, the Ogoni managed to expel Shell from their territory. Their proposal to “leave oil in the soil” was picked up by the Nigerian based Environmental Rights Action and in 2006, the Ecuadorian organisation Acción Ecológica proposed to leave in the ground 850 million barrels of oil from the ITT (Ishpingo, Tiputini Tambococha) wells located in the Yasuní National Park, home to some of the world’s richest biodiversity and the ancestral home of the Huaorani and other un-contacted indigenous tribes. Their proposal was pushed by the then Minister of Energy and Mines, Alberto Acosta, and endorsed by President Rafael Correa. Ecuador would make a financial effort for the good of indigenous peoples rights, biodiversity and that of humanity. The country requested foreign contributions equivalent to about half of the money that would have been earned, some US$ 3.6 billion in total, paid over a period of ten years. These contributions would be deposited in a trust fund jointly administered with the UNDP. It formed on 3rd August 2010 and the money will be used for social investment, environmental reparations in oil areas, and the development of energy alternatives. The offer is in place and the money is arriving, but far from fast enough. At any time now, Rafael Correa is expected to announce plan B. If burnt, it would produce 410 million ton of carbon dioxide. See the EJOLT video on Yasuni to understand why that would be a tragedy with global consequences far beyond the added carbon. Of course, the idea to leave some fossil fuels in the ground is much older than that. Svante Arrhenius, a Swedish chemist and Nobel laureate, published the first articles on climate change in 1896. Arrhenius announced that by burning coal found underground, industrialised countries were releasing more and more carbon dioxide in the atmosphere and that this would increase temperatures. He could not know that in the twentieth century coal burning worldwide would increase seven-fold. In this sense, the proposal to leave some of the oil, coal and gas underground is not new but more reasonable than ever. 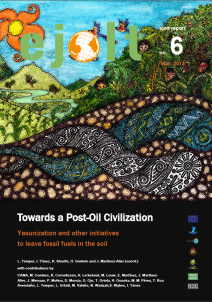 EJOLT’s Yasunization report highlights why the EU should urgently support initiatives such as the Yasuni and grassroots proposals to leave oil in the soil. The concept has caught such fire with similar proposals laid out in many other oil-extraction countries that it needed a new word: yasunize. “Towards a Post-Oil Civilization. Yasunization and other initiatives to leave fossil fuels in the soil” gives a historical perspective from Ecuador and Nigeria, features a successful campaign in Colombia, advocates against the dirtiest forms of crude and argues why Kenya should not exploit recently discovered oil. The report also charts the rise of fracktivism, shows how glocal alliances for climate justice are formed by grassroots communities at both ends of the pipeline and explains how oil exploration in offshore waters in Italy, Spain and other European crisis-stricken countries may lead to increased regional and territorial conflicts. Other chapters deal with the international legal grounds for stopping extraction in National Parks and in Indigenous territories, economic mechanisms for keeping oil in the ground and last but not least: the political ecology of the Yasuni initiative and what is has to offer in terms of new radical forms of environmental governance. We know the task ahead is daunting, but we are hopeful. When the movements in the North and the South meet up, they could form a global force that turns the short-term economic agenda upside down. There are local and global reasons for “Yasunizing” the world. They’re all in the report, so now let’s take them out there!